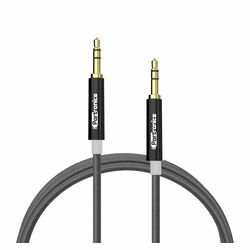 Presenting Portronics Konnect - the premium 3.5mm stereo aux cable engineered with 24K Gold plated metal connectors, soft cotton braided design, and strain-relief rings to increase the flexibility, durability and superior loss-less audio transmission even with heavy use. Konnect is compatible with iPod, iPhone, iPad, Kindle Fire tablets, Samsung Galaxy smartphones and tablets, Google Nexus smartphones and tablets, most standard MP3 players, and AUX supporting devices. Just connect these smartdevices to your audio systems or your car's stereo system, and enjoy clear distortion-free music. Available in three colors â€“ Grey, Golden & Silver to suit your taste.